On November 2nd, 1825, just forty years after the date of the first Improvement Act of 1785, the Council resolved to apply for an Act for opening and widening Lord Street, Castle Ditch, Pool Lane, and other places, where the houses were old and had become dilapidated. Whilst the streets were very narrow and unsuitable for the growing commerce and population of the town. The Act having been obtained, the houses of the Castle Ditch, opposite to St. George's Church, were demolished, and the building of St. George's Crescent was commenced in May of 1827. 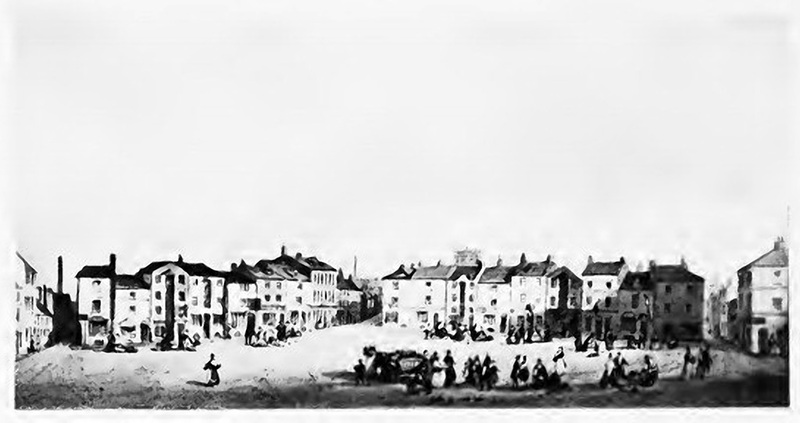 The appearance of the town was greatly improved by the erection of these handsome buildings, and the great improvement can be seen in this illustration by C and G Payne c1830. These very necessary improvements cost the town the large sum of £170,000. But it was money well spent, and a writer of the period says, " We congratulate the Town and Corporation of Liverpool on the happy issue of their recent exertions for its improvement, which have invested it with a grandeur and magnificence that will enable it to contest in the palm of enterprise with the Metropolis itself." Castle Ditch was an extremely narrow lane, about four yards wide, running from Castle Street to Pool Lane (South Castle Street) across the tops of Harrington Street, Lord Street, and Cable Street. 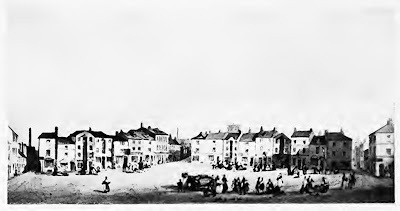 In the illustration below the spectator is looking towards the entrance of those streets, and the middle one of the three is Lord Street. On the opposite side of Castle Ditch there was a sort of island of closely packed houses, lying between the top of Lord Street and St. George's Church, where the Queen Victoria Memorial now stands. It is convenient here to speak of Preeson's Row a row of houses named after Alderman Preeson, and probably built by him. It lay on the west side of the Castle, that is the opposite side to Castle Ditch. Castle Ditch East Side, 1756. In the illustration below we are looking from the top of Lord Street towards the river, and therefore we are facing the west side of Castle Ditch. It is apparent that the houses closed all direct communication between Lord Street and the river, and it is equally clear that their removal was necessary in order that another main artery for the increasing commerce of the town might be provided. The spire seen behind the houses is that of St. George's Church, which stood where the Queen Victoria Memorial now is. The opening on the right of the picture is Castle Street, and the one on the left is Pool Lane, or South Castle Street. Castle Ditch was very narrow, as stated previously, but the exaggerated foreground in both this and the previous picture scarcely conveys that impression. 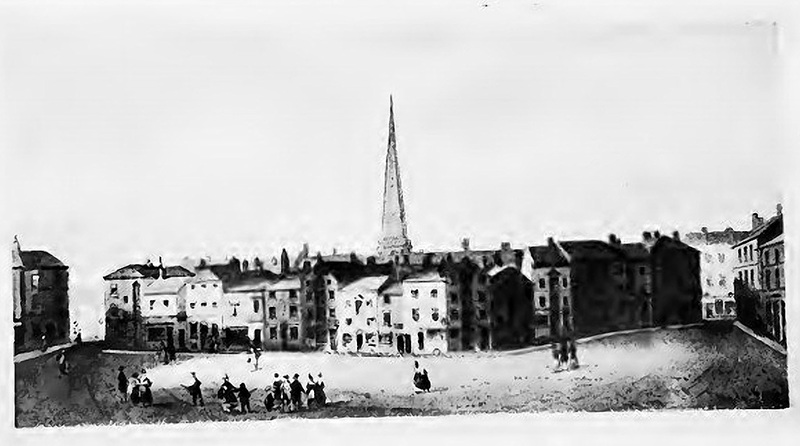 St George’s Church in Derby Square was founded in 1734 and closed in 1897. 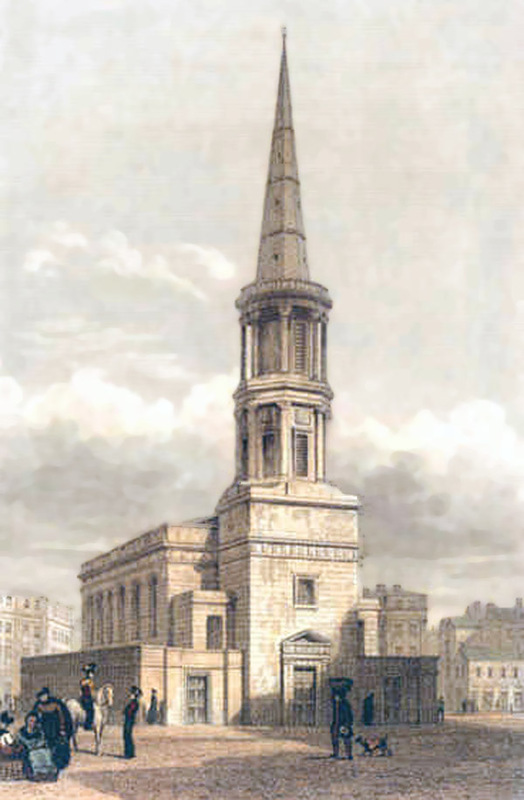 The history of St. George's Church, begins in 1715, when an Act of Parliament was obtained in 1715, and Construction began in 1726 and this was on the site of the now dilapidated, Liverpool Castle, the church was completed and consecrated in 1734. 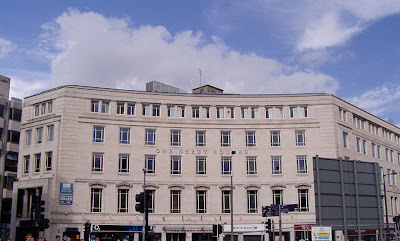 The architect was Thomas Steers and in its initial state the 'Stranger in Liverpool' reports that 'it had originally an elegant terrace, supported by rustic arches, on one side; these arches the frequenters of Red Cross market used to occupy'. 'At one end of the 'terrace' '(records Rev. Thom) 'was the office of the clerk of the market; at the other that of the night watch. There was a vault beneath the church for interments. The interior fittings were good. The east window had a picture of the Crucifixion, inserted in 1832. There were originally two ministers, the chaplain and the lecturer, and the appointment was usually a stepping-stone to the rectory.' In its time it was regarded as 'one of the handsomest in the kingdom.' and it is conspicuous on many engravings from this time, both of the City and of the waterfront. The entire church was rebuilt piecemeal between 1819 and 1825 when structural problems were gradually revealed and a new spire, reduced in height was finally added in 1833. The original having developed problems as early as 1760. The engraving here is shows the rebuilt church constructed after a design by John Foster. This reopened on Sunday September 11th 1825, it also probably shows the 'reduced' spire . 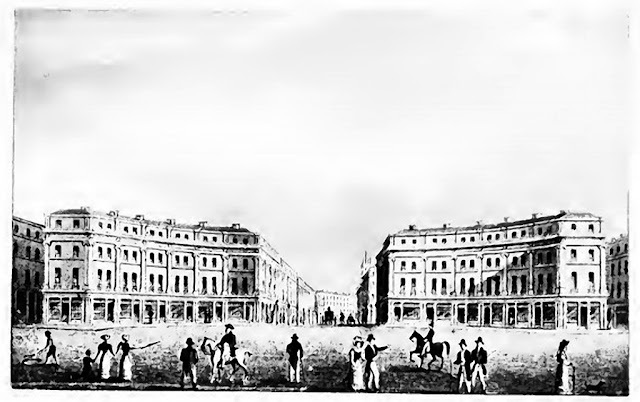 Demolition of the surrounding houses began in 1827 and within a few years St. George's Crescent, shown on later maps and also designed by Foster, was built around the church. Having long failed to attract a congregation the church was closed in 1897 and subsequently demolished. In 1902 the site was used for the construction of the Victoria Monument, which survives to this day. Much of St George’s crescent was demolished during the 1941 May blitz. background. Lord Street is to the left and South Castle Street (pictured above) in the centre. The remarkably-unscathed Queen Victoria Monument in Derby Square is in the foreground. The buildings around the square were rebuilt after WWII and the crescent restored in keeping with the original design. 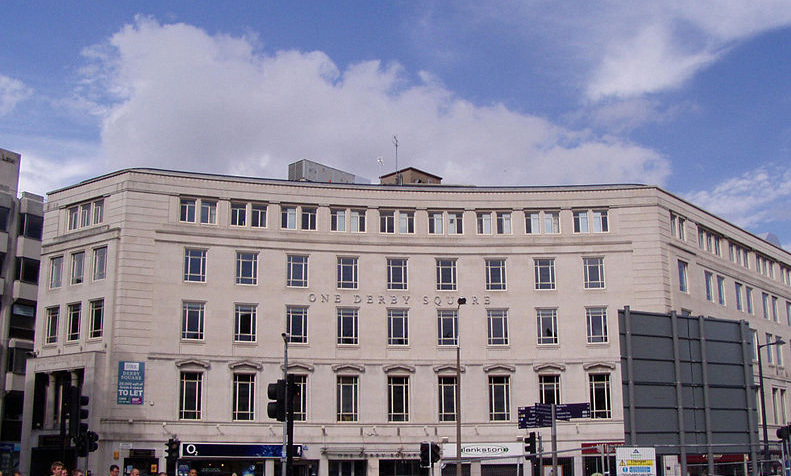 Queen Elizabeth II Law Courts, Derby Square, opened in 1984 and built by Farmer and Dark, now stands in Derby Square.